It seemed virtually impossible to transfer iPod files to a PC, or copy DVDs/videos/music to iPod with just one application. 4Media iPod Max now makes this a reality. This great iPod transfer software not only can transfer iPod supported videos/music/photos from PC to iPod and vice versa, it can also copy and backup files from iPod to iTunes (Supports iTunes 10). DVD movies and videos/audio in other formats can all be copied to iPod, as the application can convert DVD movies to iPod and convert most videos/audio to iPod video/audio formats then transfer them to iPod in one quick step. Moreover, up to 26 iPods are supported so you can easily transfer files between several iPods at once. Finally, you can also use it as an iPhone Transfer tool to transfer files between iPhone and PC, iPhone and iTunes, or even iPhone and iPods. 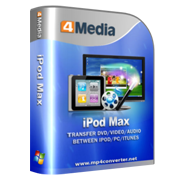 Manage and backup your iPod/iPhone files on your PC with 4Media iPod Max now and build the perfect file transfer platform between your PC and your iPod/iPhone. 4Media iPod Max is compatible with all iPod/iPhone types and versions: iPod touch, iPod touch firmware 3.0, iPod nano, iPod shuffle, iPod mini, iPhone, iPhone 3G, iPhone 3GS, iPhone OS 3.0 and iPhone 4. Transfer iPod/iPhone music, video, and photo files to your PC or the iTunes library at high speed for permanent backup. Never have to worry about losing a single iPod file again. Add iPod supported music, videos and photos you favor from PC to iPod or iPhone as easily and handily as iTunes! 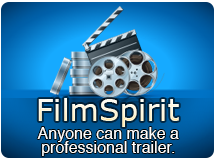 Convert DVD movies to iPod MP4 videos or MP3/M4A music, and transfer them to iPod/iPhone with a single click. This iPod backup software can convert almost all video/audio files including AVI, MPEG, WMV, WMA, etc. to iPod MP4, MP3, M4A files and transfer them to iPod/iPhone in one step. iPod to iPod file Transfer: Connect up multiple iPods and One iPhone and manage them all in one go. Transfer files among them by drag-and-drop. Install this iPod manager software on your iPod and manage your iPod files on any computer without installing it again. Allow you to transfer video and audio clips to many iPods and one iPhone at the same time and also share files among them. You can use the default optimized profiles to convert DVD/video/audio files to iPod, or customize the bit rate, resolution, frame rate, target format, etc. to create your own profiles. The ID3 tag info such as name, artist, album, and year can all be edited in this iPod manager. Support batch editing for multiple files at the same time. Comes with a built-in resizable media player allowing you to play DVD movies, video/audio and iPod files at your convenience. Create, rename or delete iPod playlists; organize photos with customized photo albums and add one photo into multiple albums without any limitation; find what you want quickly with Filter and Quick Search tools like you do in iTunes; view your music, video, and photo as a list or as thumbnails. Add illustrations for your music and movies in thumbnail mode. Information about your iPod including type, capacity, version number, serial number, and format are all listed on the main interface to help you to manage your iPod easier. With this iPod manager software installed, you can access your iPhone from Windows Explorer and manage it as a portable hard disk. The interface is very intuitive and user-friendly making tasks such as file viewing, searching, and transferring quick and straightforward. This iPod backup software uses the least amount of time to transfer video and music files between iPod and PC. How to transfer files between iPod and your computer?